Representation in 2018 by three galleries in New york City: Viviana Puello Gallery, Grimandi Gallery and Saphira and Ventura Gallery. Received "Masters Award 2018"- awarded to 60 artists internationally by Art Tour International magazine. My painting "Vapor" was on the cover of Art Tour International magazine, Spring, 2018. Was interviewed by art personality Viviana Puello for her show on television "Art-to-Heart' broadcast in NYC every Thursday evening and streamed all over. This was a 16 minute interview. The Pet Philanthropy Circle’s mission is to save and enhance the quality of animal lives by promoting greater public awareness of their welfare and the causes that protect them. We accomplish this through educational programs, raising funds for qualified animal rescue organizations and the Pet Hero Awards. 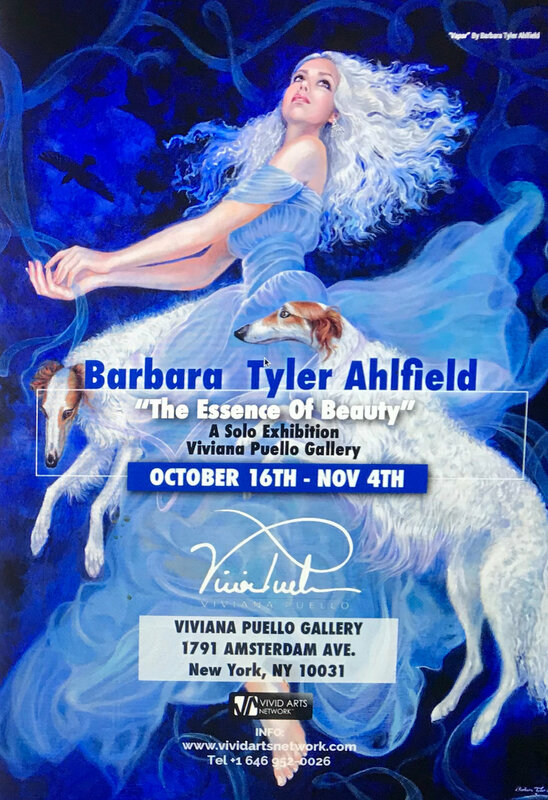 Barbara Tyler Ahlfield was a sponsor and donated her services as a portrait artist for this charity. She is currently working on a painting that was bid on at their auction at the gala event. “Feline Fashion Harem” depicts the model, Alexandra, attired in brown velvet, lounging with her three cats on a decadent pillowed daybed. Barbara Tyler Ahlfield is a career fashion illustrator who has made a second career as an oil painter. She unites her expertise in fashion illustration with modern portraiture. Selected for the cover is “Cotton Candy”. The eighth edition of Art Hamptons at the spectacular 95-acre Sculpture Field of Nova’s Ark in Bridgehampton. The Fair pays tribute to the well-respected East End region as a Mecca for the creation and patronage of art. Hamptons Pet magazine is "the Global Luxury Pet magazine", the most upscale and affluent pet magazine in the country. For nearly a century, the Hamptons has been synonymous with the playground for the rich and famous, summertime vacation, and weekend getaways for those in need of rest and relaxation. Hamptons pet parents seek out the best, buy the best, and demand the best pet products in the market today. Located in the heart of Midtown Manhattan, this jewel of historic New York hotels commands the center of 44th Street, close to the bustling heart of Times Square and Fifth Avenue. Matilda is the famous resident feline at the Algonquin hotel in NYC and I painted her portrait. This is the current Matilda- there have been many since the 1920's. Matilda is a New York legend. Welcome to Rosenstiel's, Fine Art Publisher since 1880 for trade customers worldwide. You will find all our Open Editions and Giclée Prints. A series of fashion illustrations of eight of my looser illustrations are offered as prints on paper or canvas in three sizes. Established in 1997 by Nancy and Alan Gilbert, d.o.c. was founded to serve professional photographers, artists, and designers needing high caliber performance in the emerging field of digital photography and artist services. Today the d.o.c. team consistently delivers excellence in archival fine art printing, high resolution copy work, digital imaging processing, and retouching. commercial art to contemporary fine art.